I don't think I could have met the great Barefoot Ken Bob at a better time in my barefoot running adventure. I have had time to learn from the internet and advance to a point of comfort, but still need to work out some kinks. We met up at Drake Field. My parents drove me down there, since they wanted to GeoCache around there anyway. After searching, a group of barefoot people appeared over the horizon. They all seemed to be talking and enjoying themselves. This must be the place! 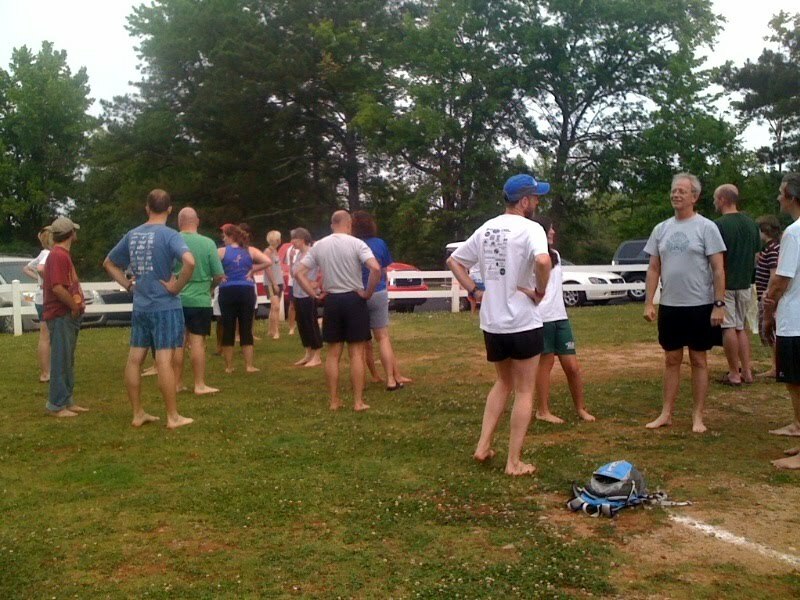 The first known person I spotted, well besides Barefoot Ken Bob, was Barefoot TJ from Barefoot Runners Society. She greeted me with a hug. She is so nice. Within twenty seconds Mokaman, also from Barefoot Runners Society, came up and shook my hand. I had vaguely remembered him from the site, but I wasn't sure what he looked like. We talked about the Appalachian Mountains and the various trails out there. I think I need to hang out with this guy more. He seems really cool. After wondering around I found that I did not drive the farthest to get there, two hours, but someone from South Carolina was there! He was a cool dude. I think his name was James, or Justin, or something like that. This just shows how far people are willing to travel to get some of the best barefooting instruction this world has to offer. There were some great people there! Barefoot Ken Bob took the stage with his dog, Herman. He went over some of the basic things that are covered on his How To Run section of his site.He took questions, then took us on a group run through Drake Field and along the asphalt trail that goes around it. There was a spot with clay, which made some beautiful art across the asphalt. We began running on the asphalt trail. During this time I caught up to him and asked him about running through really rocky trails. He summed it up as, "If you are jumping around to avoid the rocks more than going forward, you might-as-well just run straight through the rocks." Great advice! I tried this today and it holds true! After that he gave autographs, answered some more questions, and took pictures. He signed my shirt and took a picture with me. Let me just say. This man loves what he does and truly enjoys his life. He is constantly smiling and always supportive. The way he acted with his wife(she is deaf) was great to see. He is patient and loving of her, even when there was a communication issue(He was asking her something and she was having a hard time getting all the details of the question). He is so chill and happy, I just can't see him ever getting frustrated or mad at anyone or anything. 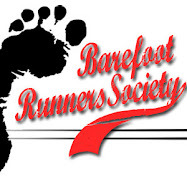 On top of learning about running barefoot, I witnessed people treating other people right. That makes the two hour drive worth it right there. "I witnessed people treating other people right." I liked that too. I'm jealous you got to meet Herman, though.